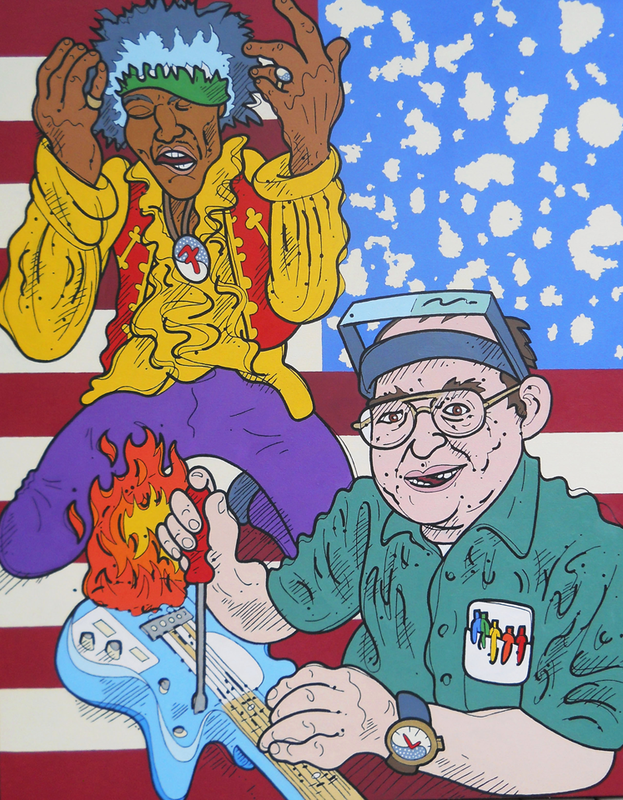 In “Fender Bender”, I make Jimi Hendrix a supporting character in his own painting by focusing on his instrument rather than his athleticism in using it. Hendrix’s guitar, which he used to create, but then would famously destroy, was designed and built by Leo Fender, a simple working man with an unlikely interest in loud electric musical instruments. With a nod toward both patriotic and counter cultures in the late 1960s, I paint a semblance of an American flag into the background, rendered here in political convention television colors. The guitar-burning is Monterey, the flag is Woodstock, and those two concerts roughly bracketed Hendrix’s very brief time in the limelight. The 50 stars are actual stars seen in the heavens.